Is get really really excited over a particular yarn. Yes, I love yarn and I love a lot of them equally and for various reasons. But rarely does one stand out far above the rest. But today I am going to show you one that does. To work out of the box a little I’ve been playing with some cottons lately. I’ve just been seeing if I can get a feel for them, if I can like them and if my hands can handle knitting with them. And I’ve been fairly pleased with what I’ve picked. Last Friday Bug got really sick, and I decided I needed a new project. I had this cotton slub yarn sitting around my stash for awhile, done by Dyeabolical. I had come across the pattern Sassymetrical and thought that the yarn/pattern pairing would be quite interesting. And the more mindless knitting would be perfect for the in between caring for a sick child spaces. Well, I completely and utterly fell in love with this yarn! It is so soft, the slubs add so much interest to the stockinette, and the dye job is so stunning! 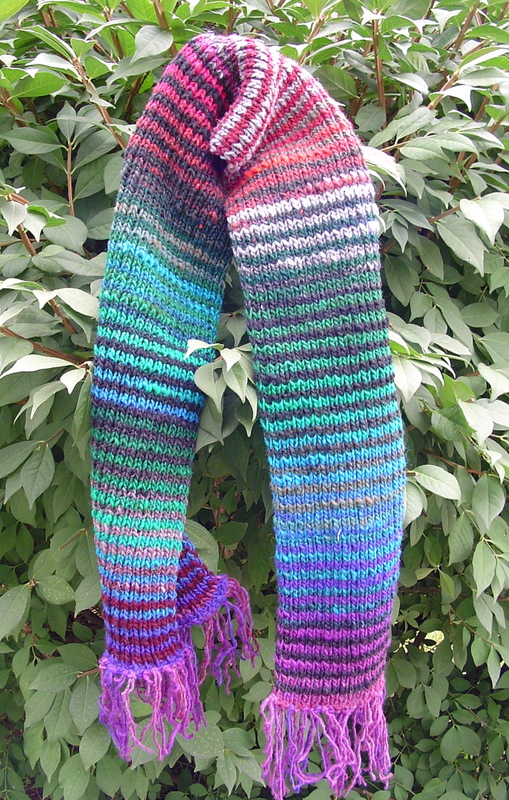 The color is gorgeous and saturated with just enough light variation to hold interest and compliment the slubby yarn. Furthermore, she must be awfully generous, this entire long sweater only took two skeins of yarn! 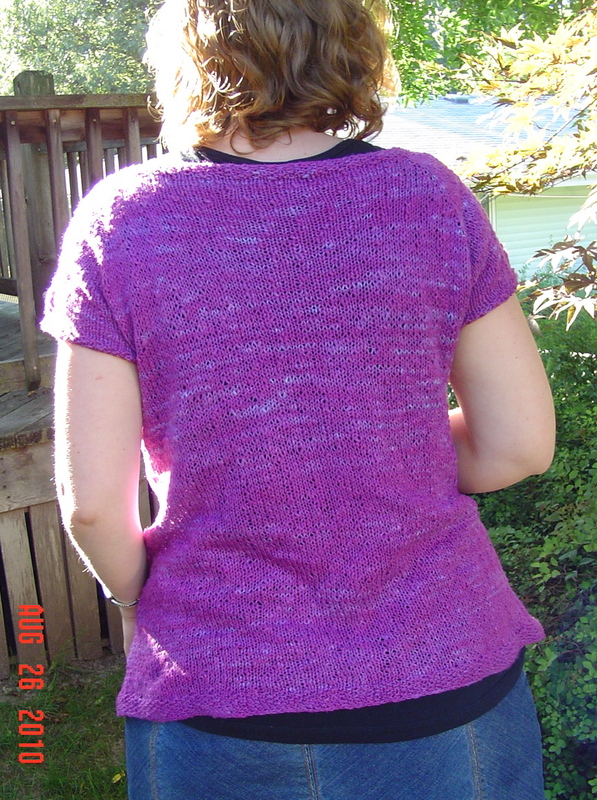 I just loved knitting this sweater and it was tough to not turn around and knit another. Now what do I do with my third skein? Modifications made to the pattern: Of course I needed it larger than the size XS that the pattern is written in. I increased to about 7 inches at the yoke and then knit to 9 inches before dividing for the sleeves. When I joined the sides and back I cast on 3 stitches under the arms for extra ease in that area. When picking up stitches for the sleeves I picked up a total of 8 under each arm. I did the puff sleeve but added an additional row of seed stitch before casting off. In conclusion….go find dyeabolical’s cotton slub yarn and get some! I’ve contracted it, I can’t seem to knit with anything else right now. First there was the baby jumper, and then I cast on a pair of two at a time socks in silk garden sock, and then I just had to bring out the kureyon in order to do the noro striped scarf I’d been eyeing for years. It was a weekend project. I am tempted to turn right around and do another. After I finished my last big lace project (or during, I don’t remember now) I decided I needed to use up some of my lace stash and fast. So I pulled out a Tilli Tomas kit I had purchased on destash. 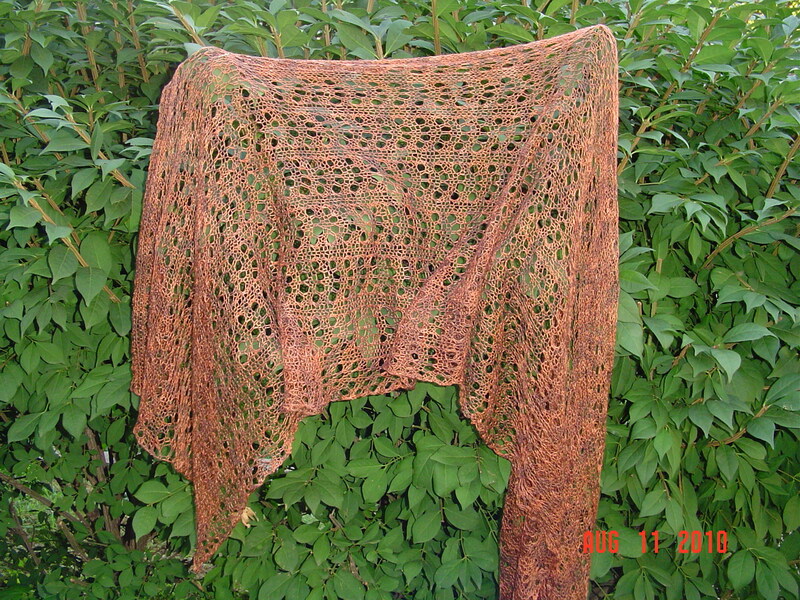 The kit contained 2 skeins of Tilli Tomas voile de la mer as well as a pattern for a shawl called Mystique. The brown tones of this particular colorway are tones I wear often in the winter and the pattern calls for size 10 needles so I knew it would knit up quickly. The pattern is only 4 lines long and easy to memorize. It is also pretty simple to see when you’ve gotten a little off in the pattern, so I would even call it lace you can actually knit in front of people. 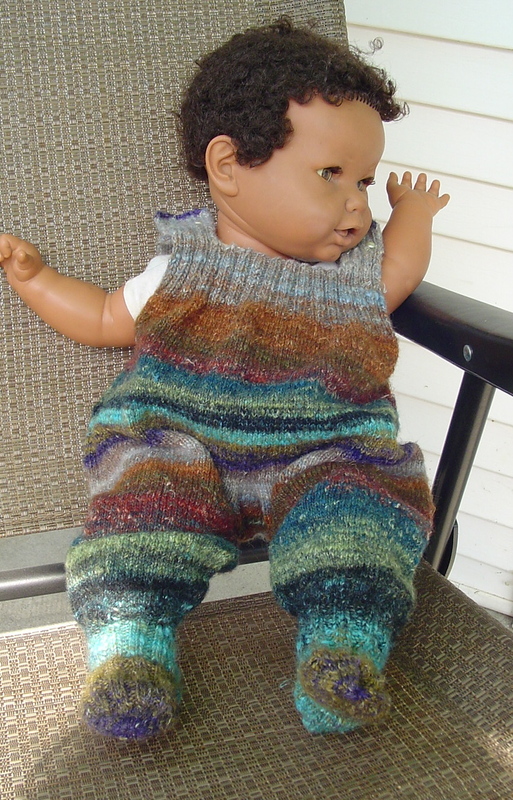 I had it about half finished before I left for vacation, and I managed to finish it off the same day I finished the baby jumper. When I returned home I realized that I had dropped a stitch somewhere along the way, so repair was imminent. It wasn’t too tough to repair though, and Bug and I blocked it on Tuesday night. I love the color on this one and think it will make a great indoor scarf for the winter. If I don’t snag it, which I’ve been doing if I even look at it sideways. I had the rare and unique opportunity recently to knit for an upcoming baby. I’ve not done a whole lot of that, as I think your average person doesn’t appreciate it all that much. 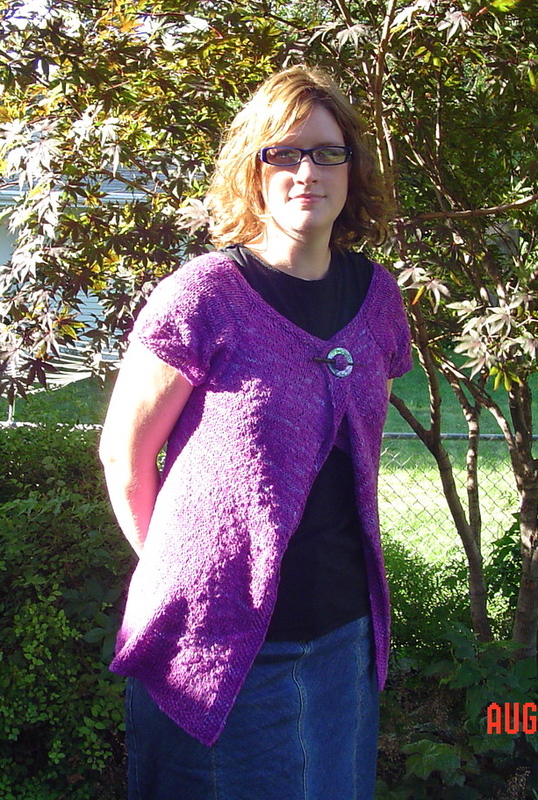 But this project is for a fellow knitter, so I felt confident I could knit to her tastes. I know she likes noro yarns as well as lots of colors. So I found a lovely little jumper in a newborn size, got some noro silk garden sock, and totally went to town. I knew this was going to be my main project on vacation since it was a secret and I couldn’t work it at home. And indeed, it was easy to complete in that time period. The pattern is Pepita which I think is irresistibly adorable. Modeled on my old favorite doll Miles. I think the little socks are too cute and fun. The fabric is nice and thick making it practically a snow suit. Notice how I managed to make the legs match? That was quite a challenge, but I am glad I took the time to do it. As many of you know, I’ve been on vacation for the last week and a half. I’ve only just returned. And though the vacation was action packed, there was still ample time for knitting. Which also means that I have a few posts, as well as a few vacation pictures this week. The first thing I have to show is my airplane knitting. I generally keep something quite simple on hand. I’d already finished the first sock quite some time ago, but I’ve been less than inspired to knit socks lately so the second sock was languishing in a pile of unfinished objects, not at all one of my priorities. Sadly, since there was time in between the two socks, I made a large mistake in the foot of the second sock, and didn’t discover it until I started the toe. This meant I had to rip half a sock back on my airplane ride. But it was reknit and the toe finished last evening once I got home. The yarn is trekking XXXL, a 4 ply sock weight with long color changes, I think this is my favorite of the work horse yarns thus far. I love the rainbow colors!